Algae issue is something that we can’t avoid but we can do our best to minimized the damage. 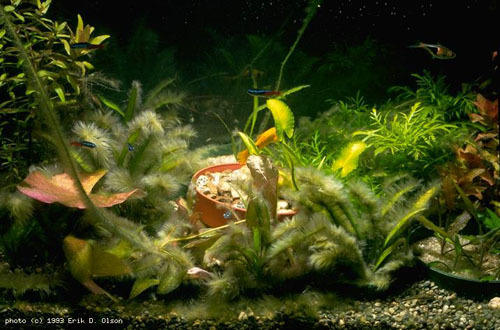 In a planted aquarium, an even more complex set of variables can easily go out of whack, and it might just end up a totally green tank. There are 3 common types of algae that require external chemical treatment to reduce its problem. These algae are the ones that will not be able to be “cleaned up” by the fishes and shrimps in the tank. Poor water circulation – Circulation is key in a planted aquarium so that no “dead spots” are present where nutrients have been used up locally, but fresh ones are not being recirculated throughout. Erythromycin – use antibiotics at half dosage to kill the bacteria. Mardel Labs’ Maracyn contains erythromycin and has been used effectively without harming most plants. Black Brush Algae, or BBA, is one of a member of the specific genera of “red” algae in the Rhodophyta family. Most of the algae in this family are marine based, but some have adapted to freshwater conditions that particularly target our beautifully planted aquariums. These algae may be black, brown, red, or green in coloration, and can quickly coat your plants and hardscape if not controlled properly. The Black Brush Algae has a photosynthesizing auxiliary pigment called phycoerythrin which absorb blue light and reflect red. 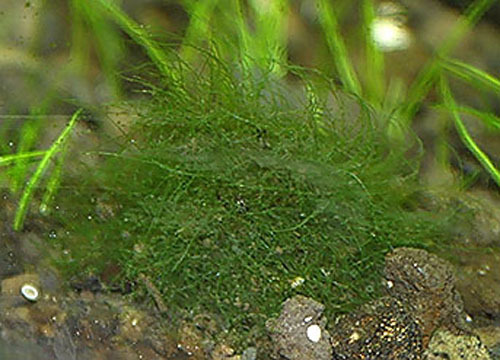 Therefre, BBA is usually black to purplish-gray in colour instead of green like other algae. It forms short hairs (1/4″ long) that grows closely packed together. It grows on slow growing plants and solid surfaces such as decoration and substrate. When growing on plants, in usually grow around the edges of the leaves. 1. Nutrient Imbalance – potentially excess of Nitrogen (N), Phosphorus (P), and Iron (Fe). 2. Low pH – Neil Frank observes that African Rift tanks never have BBA. It’s believed that BBA thrives in acidic environments, which is unfortunately what most plants prefer. 1. 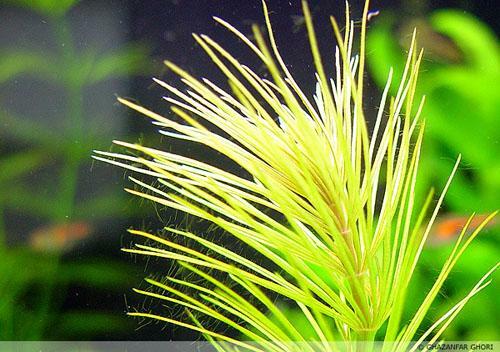 Increase CO2 – This will stimulate plant growth, which should help the plants out-compete the algae for resources. 2. Excel/Hydrogen Peroxide (H202 treatment) – Use a syringe to spot treat problematic areas. Then manually remove when BBA turns grey/white. 3. Manual removal – Use toothbrush to remove as much as possible. 4. Bleach treatment – Dip affected hardscape items/hardy plants in a bleach/water solution using a 1:20 ratio of bleach to water. Before putting them back into the tank, make sure the item is free of bleach odor. 5. OxiClean treatment – Dip affected hardscape items in a OxiClean solution, making sure you only use the original OxiClean with no other additives. 6. Maintain proper water change/dosing schedule – weekly / bi-weekly changes. 7. 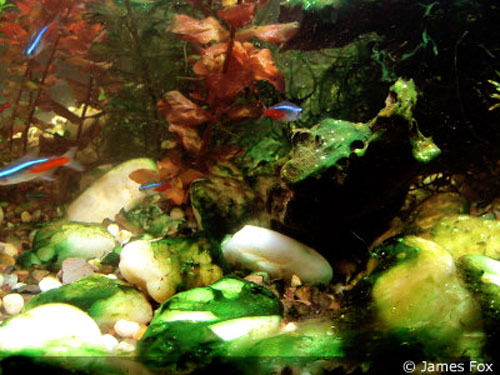 Algae Crew – Siamese Algae Eaters (SAE), American Flag Fish, and Amano shrimps are known to eat this algae. 8. Copper (not recommended) – There are commercial algaecides containing copper that will kill BBA, but they will mostly likely also kill your plants. 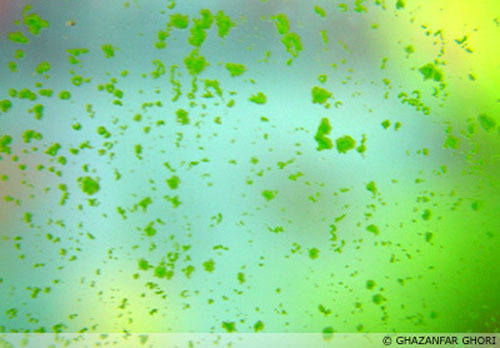 Green water is free floating single-celled euglenoid protists. It contains chlorophyll a and b, plus carotenoids, giving them their green coloration, but they are not plants. With over 40 genera of Euglenoids and over 1000 species, this form of algae is one of the most abundant forms of life on the planet, and is an essential part of the food chain. Unfortunately, aquarists don’t want it in their tanks. 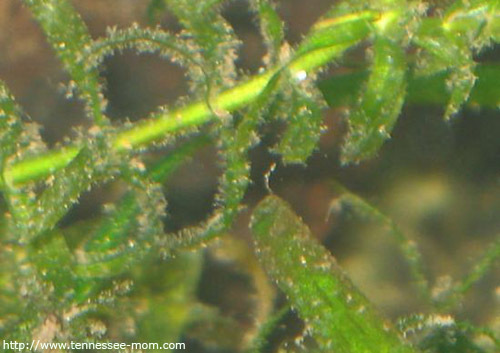 Green spot algae is very commonly seen on the glass of tanks when there hasn’t been a water change in awhile, or when an inadequate fertilization scheme has been conducted. GSA also appears on long lasting leaves, such as Java Fern, Anubias, and Bolbitus.